Cozy with Concrete » Would You Like to Try a Sample? This week my company, Nick Dancer Concrete, completed stained concrete floor samples for the concrete floor in the new Auer Art Center in downtown Fort Wayne, Indiana. My company always completes on-site samples for concrete floors, but this week made me realize how important this actually is. The process for this project included removing very thick carpet glue before being able to start the staining process. The goal was to complete 3 samples; 1 acid stain, 1 no stain (natural concrete color), and 1 water-based stain. 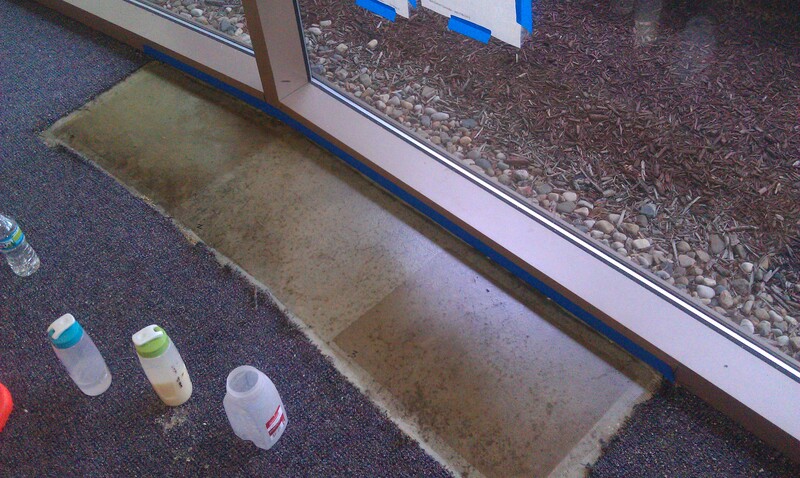 After removing the carpet glue with a no-odor, soy-based material, the concrete was ready to be cleaned and stained. The process took about a whole day but the benefits of this are worth the time and effort. During the sampling process we were able to see the condition of the underlying concrete, how the stains will react, and what the finished floor can be expected to look like. Without this process we would be picking colors off a color sheet, but sometimes, no wait, most times the floor will not come out as expected (I have heard many horror stories about this). The concrete stain colors the concrete from a chemical reaction with the free lime contained in the cement, or if using a water-based stain, it will use the base color of the concrete as the canvas for the finished color of the floor. Concrete can be 1000 different shades of grey and the free lime in the cement is different for every concrete slab, so it is vital to discover this information prior to starting the project. By knowing how the concrete will work with the stains we can provide accurate samples for the finished floor. On this particular project we found that the chemical stain did not produce the desired results (this is why samples are done). The good news is that the natural concrete color and the water-based stain produced excellent results. By producing these samples we not only display the color that will be produced but also how the finished floor will look sealed and finished. Hopefully we can be part of this exiting renovation and serve the downtown Fort Wayne community.